Redland Community Centre is conveniently located between two shopping malls and adjacent to the bus terminal (2 min walking). The Centre has a number of different sized rooms available for hire on either weekdays or weekends. Rooms are suitable for either smaller business type meetings to larger group training sessions/activities or organisational gatherings. All rooms have disabled access and toilet facilities. Level 1 rooms are easily accessed by a lift and/or stairs. All of the rooms have natural light, with room rental inclusive of tables and chairs. Equipment hire is also available including; laptop, tv, whiteboards and projector. Wifi is free for all room hires. 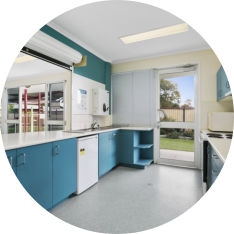 A full kitchen is located on the ground floor, along with a children’s play area with wooden play equipment on synthetic grass. Tea and coffee with disposable cups is available at an extra charge. Please contact Leenore at Redland Community Centre to discuss room availability/suitability or request a viewing. Approximate size of meeting room (excluding kitchen): 4 metres x 5.4 metres. Approximate size of meeting room – 9 metres x 8.2 metres.